For large eruptions on the Sun, it is often a problem that the core dimming region cannot be observed due to the bright emission from the flare itself. However, spectroscopic data can provide the missing information through the measurement of Doppler velocities. In this paper we analyse the well-studied flare and coronal mass ejection that erupted on the Sun on 13 December 2006 and reached the Earth on 14 December 2006. In this example, although the imaging data were saturated at the flare site itself, by using velocity measurements we could extract information on the core dimming region, as well as on remote dimmings. 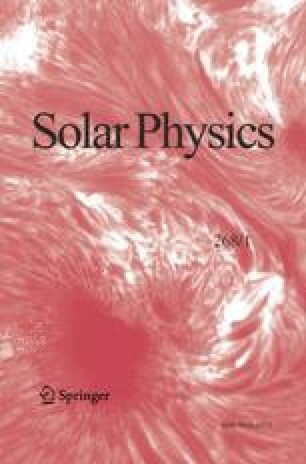 The purpose of this paper is to determine more accurately the magnetic flux of the solar source region, potentially involved in the ejection, through a new technique. The results of its application are compared to the flux in the magnetic cloud observed at 1 AU, as a way to check the reliability of this technique. We analysed data from the Hinode EUV Imaging Spectrometer to estimate the Doppler velocity in the active region and its surroundings before and after the event. This allowed us to determine a Doppler velocity ‘difference’ image. We used the velocity difference image overlayed on a Michelson Doppler Imager magnetogram to identify the regions in which the blue shifts were more prominent after the event; the magnetic flux in these regions was used as a proxy for the ejected flux and compared to the magnetic cloud flux. This new method provides a more accurate flux determination in the solar source region.